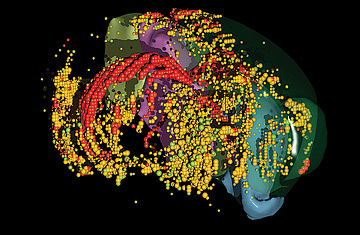 Computationally reconstructed 3D rendering of a mouse brain. You might think a mouse's brain would be of little help explaining the genetic workings of the human brain. Not only is the mouse version tiny--it weighs just 0.02 oz., compared with the 3-lb. behemoth in a human--but a mouse's rudimentary intelligence and cognition are correspondingly feeble. Still, despite these glaring differences, the genes responsible for building and operating both organs are 90% identical--which means that the mouse brain can be a powerful tool for unraveling the mystery of human mental disorders. That's the idea behind the Allen Brain Atlas (ABA). Launched in September with $100 million from Microsoft co-founder Paul Allen, the atlas is the first Web-based, public-access database of all 20,000 or so genes expressed in the mouse brain. Want to know where in the brain a specific gene is active? The ABA has it, in vivid three-dimensional color. Curious about what types of brain cells are actively expressing a particular gene? The atlas provides molecular-level data that tell you. "Even though it's a mouse project, it really is a wonderful resource for human genetics and human biology and for understanding the brain in both the healthy and disease states," says Robert Williams, a neurobiologist at the University of Tennessee. Williams and other brain researchers are already finding that the atlas can be a time saver, speeding them to their ultimate goal: developing new treatments for such human neurological disorders as dementia, schizophrenia and Alzheimer's disease. In a matter of days, for example, Williams used it to home in on the most promising gene candidate among 20 he had isolated that were involved in aggression and the fear response. Analyzing each gene individually, even with high-throughput methods, would have taken months. He will next look at this gene in human populations to determine whether variants in the gene are linked to emotion-related disorders like anxiety and post-traumatic stress. The ABA has been a revelation for drug developers as well. Its data make clear that there are almost no genes that are exclusively expressed in any one structure or region. That, says Allan Jones, chief scientific officer of the Allen Institute for Brain Science, means "people will have to think harder about targeting pathways with combinations of drugs." Researchers like Dietrich Stephan at the Translational Genomics Research Institute are doing just that. Relying on the ABA, Stephan has identified a group of genes involved in age-related memory loss and has developed five compounds that mimic the activity of the genes. At least three of the new compounds appear to enhance memory function in aging rats. Although it's just a few months old and aimed at the relatively small population of brain researchers, the ABA is getting more than 12 million hits a month; as the Institute adds new information, including gene-expression data from the human brain, Jones expects that volume will continue to surge. So if scientists eventually find a cure for some of the brain's most devastating disorders, they may have a mouse to thank.